This Bluet Damselfly is a male, the females are brown. 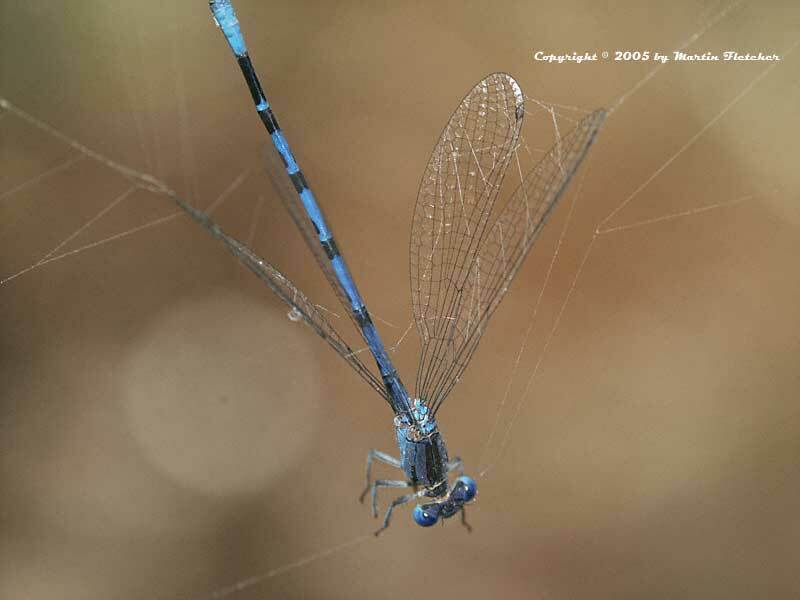 The Bluet Damselfly is the most common damselfly in California. The nymphs are a regular in my ponds and water features. The Bluet Damselfly nymphs are effective consumers of mosquito larvae and the adults are great consumers of mosquitos as adults when they are on the fly. This Bluet Damselfly is ensnared in the web of a garden spider. Slowed it down enough for my photo. The Stream Bluet Damselfly has more dark markings in the abdomen. Damselfly's usually hold their wings together when resting. The Bluet Damselfly eats mosquitos as a nymph and as an adult. High resolution photos are part of our garden image collection.